We are a dedicated repair centre. A lot of people don't know how to use a Mac let alone fix one, so when it comes to finding reliable and fast Apple Mac repairs in Lincoln or even Lincolnshire for that matter, it's not easy. Apple Macs are not like Windows based PCs, they are constructed and designed very differently. With a vast range of high quality equipment and skills, we have the ability to deal with almost every issue relating to repairs upgrades and maintenance of Apple Macs. Take a look below at some examples of repairs we offer for Apple Macs. If you’re looking for a replacement MacBook screen, you have come to the right place. We can replace broken LCD screens or just the front glass. Our supply and fitting of a new screen is guaranteed for 1 year and we only use genuine screens. OSX not starting? Just a flashing question mark or apple logo? When your Mac won't start up and just sticks on the apple logo or shows a flashing question mark. Don't worry, we can usually recover your Mac keeping all your personal documents and in a lot of cases EVERYTHING stays exactly as you left it. Looking for more speed or sotrage? We can check your Mac to see what can be upgraded to increase performance. Usually we would upgrade RAM or Hard Drives to increase performance. The best thing is, it's a LOT CHEAPER than buying a whole new machine. We can repair most liquid damaged Macs, we can strip down the entire machine and clean and heat treat the logic board. Faulty, slow or full Hard Drive? We can supply and fit many types of Hard Drives to replace your current one. If you need more space, we can clone your current drive over to a larger one so you keep all your files and programs. We also offer Solid State or Hybrid upgrades. MacBook Trackpad button not clicking? The Multi-Touch trackpad found on the MacBook, MacBook Air, and MacBook Pro is a button in itself. With a properly calibrated Multi-Touch trackpad, you should be able to click almost anywhere. We can repair or calibrate your MacBook Trackpad to enable the click function. 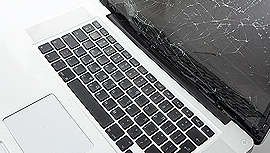 We can repair your MacBook for an affordable price, even if the whole screen is smashed. Give us a call today for a free quote and find out just how affordable it will be. 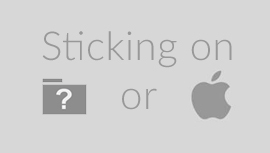 Flashing question mark or stuck apple logo? When your Mac won't start up and just sticks on the apple logo or shows a flashing question mark. Don't worry, we can usually recover your Mac keeping all your personal documents and in a lot of cases EVERYTHING stays exactly as you left it. Computerclinik.co.uk is a trading name of Koodora Ltd, a company registered in England and Wales.